Concept for a renovated PSU Smith Student Union. Should the project move ahead architects will oarde selected to develop a final design. Portland Architecture wrote an extended summary of the Restore Oregon hosted mayoral debate, where candidates discussed housing, density and preservation. In article titled “Gatekeepers of Portland character” KGW wrote about the Portland Design Commission, who are responsible for reviewing all major developments in the Central City. The Oregonian reported on the approval of 4th and Harrison, which neighbors believe is in error. The approved building has a floor area ratio (FAR) of almost 9:1, achieved through a combination of the 6:1 base FAR for the site and 3:1 in bonuses. While the applicants and City staff believe that the site is eligible for bonuses, neighborhoods contend that it isn’t, and that any building on the site should have an FAR of no more than 6:1. A bill that would allow local governments to implement Inclusionary Zoning has passed the Oregon Senate, reported The Oregonian. The bill will now heads to the House, where it is likely to pass. The Hollywood Star News asked if the Rheinlander building on NE Sandy is to bite der dust? An Early Assistance application was recently received by the City for the site at 5035 NE Sandy Blvd, indicating that the restaurant site could be redeveloped into a mixed use building of 2 to 4 stories. The Willamette Week reported that the A La Carts food cart pod has closed. The site at 4926 SE Division St is set to be redeveloped by Urban Development Group, who are planning a mixed use building with a branch of the Green Zebra grocery chain at the ground floor. A transcript of a recent American Assets Trust earning call indicated that the company is “currently evaluating various alternatives” for how to move ahead with Oregon Square. Leases at the existing office buildings on the site are being allowed to expire in order to allow the site to be redeveloped. Stating that they do not wish to “act in haste, repent at leisure”, CEO and Chairman of the AAT Board of Directors Ernest Rady stated that they are “looking at every opportunity, including some office, including some apartments, including phasing it and we are now working on examining each of those alternatives. It is a real opportunity and we want to make sure we make the most of it.” A decision on how to move forward is expected by September. Portland State University students will this April vote in a referendum over whether to increase student fees in order to finance a major renovation of the Smith Memorial Student Union, writes the PSU Vanguard. 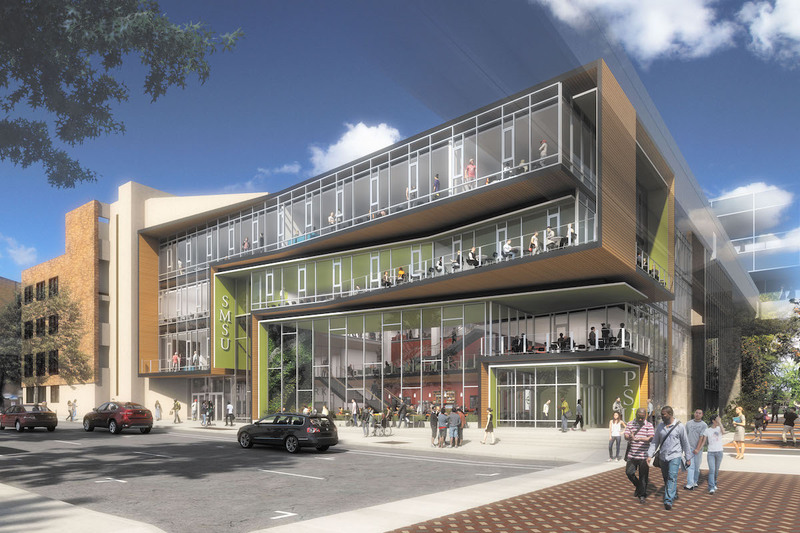 Two possible solutions include a $65 million renovation and a $90 million renovation. The Portland Chronicle published photos of Otak Architects’ under construction Cook Street Lofts on N Vancouver Avenue. The site noted that this project and adjacent project The Woods will “bring 154 units to the block previously home to three single-family dwellings”.